Posted February 28, 2014 by finnfemme & filed under Beauty, Fashion, Vintage. 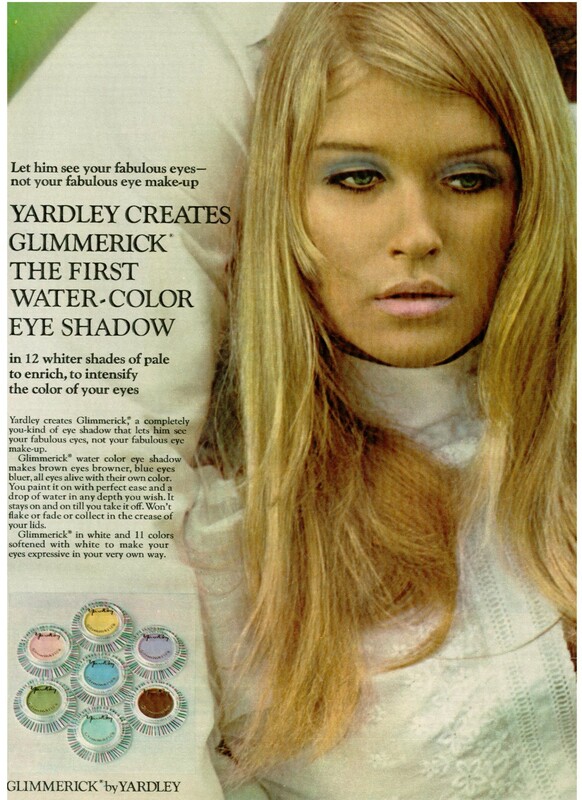 I’m on a bit of a nostalgic Yardley of London makeup kick, so here we go with another fabulous 60s/70s makeup product – Glimmerick eye shadow. Created in 1968, it was a water-color eye shadow. This means you added water to it to create your own level of color intensity. Pastel colors were all the rage – blue, lavender, aqua, yellow, and pink. This stuff was intense! It really stayed on – kind of like applying spackle. I agree I loved this paintbox with watercolor for my eyes!! Please bring this product back I believe that todays girls would love it too. I such success with this product. I have looked for it before and never found it. Please consider bringing this back. I bought this paint box in late summer 1970 at the neighborhood drugstore in Memphis, TN. Definitely remember using it the entirety of my high school senior year – 1970-71. Absolutely loved it!!! 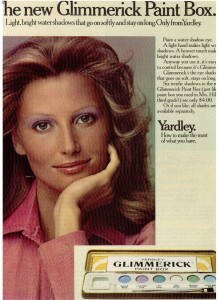 Wished they would bring back many of the Yardley products from the sixties and seventies. The Glimerick paint box was the best we would line our eyes in these gorgeous pastels and Slicker it was the best so creamy so light and the scent I can still conjure the delightful smell in my mind. I agree that I think if they brought these products back they would be a hit with today’s youth and even we women that reminisce that wonderful era will buy for it was such good products! 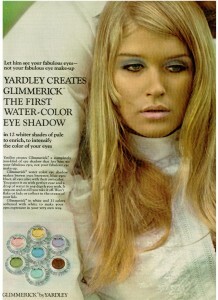 I also loved the Glimmerick line – used it all through the late 60s and 70s. And TBH I *did* look good in the blue eyeliner! 🙂 I’d give anything to have another one. 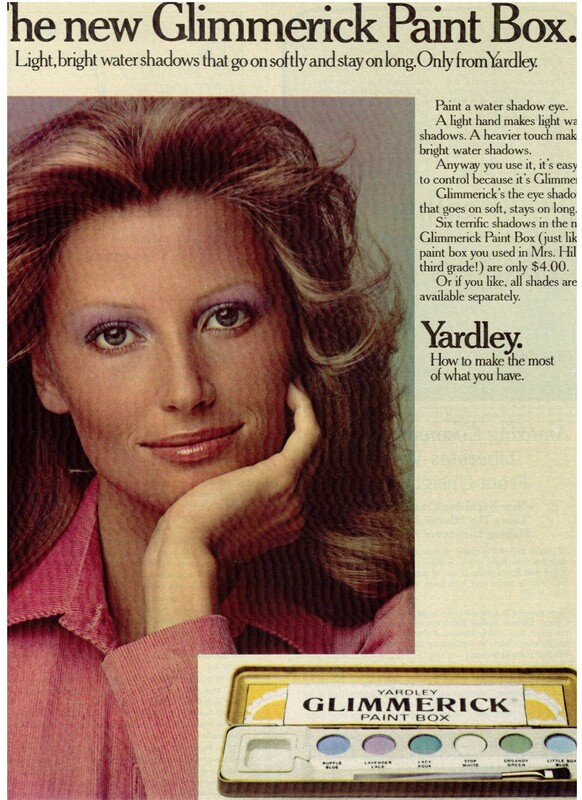 Please, Yardley, bring this back! yes…bring it back..i have spent my life looking for an eye shadow like this…seems like there was a pale blue too, i loved it and kept it for years as i little went a long way..i would give anything to have this eye shadow again!!!! I still have two of the paintboxes, and still use the eyeshadows occasionally. Wasn’t there a third box set? Please do bring them back, with the old colors and new ones too! They would be smash hits! Omg!!! I was and still obsessed with the Yardley’s! Just bought the “dolly’s”, their still good and that scent! I wish I could find the paintbox though. Brings me right back to high school!